Glaucoma is a condition in which the optic nerve, which joins the eye to the brain, undergoes damage therefore resulting in visual loss. It is usually, but not always, associated with raised intraocular pressure. A clear watery fluid, called ‘aqueous’, is produced inside the eye by cells surrounding the lens (the ciliary body). This fluid provides the necessary pressure to help maintain the shape of the eye. This pressure is called the ‘intraocular pressure’. As the aqueous circulates the inner chambers of the eye it nourishes the lens and cornea and then returns to the blood stream through a meshwork. The meshwork normally provides some resistance to the flow of aqueous, so the pressure in the eye is maintained. A number of things can happen to interfere with the normal flow of aqueous, which can result in increased pressure. The most common cause is a malfunction in the meshwork, as it may not adequately drain the aqueous from the eye. The increased intraocular pressure is transmitted across all the structures of the eye and damages the optic nerve fibres as they leave the back of the eye and travel to the brain. Sometimes even normal intraocular pressure is associated with damage to these fibres. As these nerves become damaged, then vision becomes affected. If unchecked, this process can eventually lead to blindness. 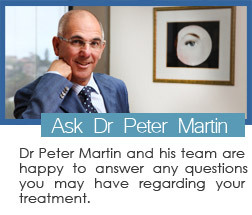 Dr Martin will identify the cause of glaucoma in order to implement the appropriate course of treatment. Glaucoma is often called the ‘silent thief of sight’ because it develops without obvious symptoms (namely in chronic glaucoma). As intraocular pressure rises slowly, damage to the actual eye structure may not be caused for many years and patients are often not aware of the gradual loss of sight. For this reason regular examinations are very important. Vision usually becomes more and more impaired and, finally, the very centre of sight begins to deteriorate as irreversible blindness sets in. Some people do experience vague symptoms, including a need for frequent change in glasses, difficulty adjusting to dark rooms, loss of side vision, and blurred vision. Rarely, other symptoms, such as the appearance of coloured rings around lights and severe headaches or pain, may occur. 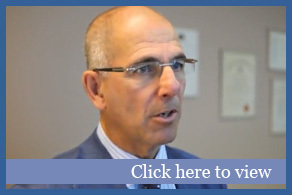 You should not wait for symptoms to appear before being tested for glaucoma. Glaucoma is present in 3% of the Australian population and although the risk for developing glaucoma increases with age, it can occur at any time. A history of previous eye injury. Other risk factors include people who are over the age of 45 or those who are using ocular steroids (cortisone) for prolonged periods. This is the most common type and accounts for 90% of cases. It progresses slowly causing a gradual deterioration of vision. This type of glaucoma typically responds well to treatment, which is usually continued for life so that the pressure is kept under control, helping to prevent vision loss. Laser treatment and/or surgery is sometimes required to allow the fluid to pass more freely out of the eye. This is a sudden increase of intraocular pressure in the eye. It must be treated immediately otherwise permanent damage to vision may occur in a very short time. Usually medication is given to reduce the pressure, then laser treatment or surgery is performed to correct the problem. Often marked symptoms are present such as severe pain in the eye, blurred vision, the appearance of coloured rings around lights and vomiting. This type of glaucoma is caused by other conditions such as inflammation of the eye, tumours, injuries or advanced cataracts. It may also occur after different types of eye surgery. This type is present at birth (or shortly thereafter) and is rare. Enlargement of the infant’s eyes as well as tearing and unusual sensitivity to light are all signs of congenital glaucoma. What is the treatment of Glaucoma? There is no cure for glaucoma, however, lowering the eye pressure usually prevents further damage or vision loss. Eye drops are the most common form of treatment and the first line of treatment tried. It is imperative that the drops be taken exactly as prescribed. Some drops may have side-effects, however Dr Martin will prescribe the drops that are most suitable for you. Sometimes tablets are also used to decrease the intraocular pressure. Occasionally, laser or surgical procedures may be necessary. Dr Martin will discuss these with you if they are necessary for your condition.